Revel, the new Atlantic City resort set to debut in May, will feature Azure by Allegretti, featuring cuisine of the Italian and French Riviera. The new restaurant is the culinary creation of acclaimed chef Alain Allegretti. Azure by Allegretti brings together the flavors of Chef Allegretti’s culinary experiences in the kitchen with his Italian grandmother, the Michelin-starred restaurants of Jacques Maximin and Alain Ducasse, as well as his own restaurant in New York City, La Promenade des Anglais. 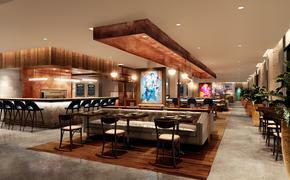 Chef Allegretti’s restaurant will be a cornerstone of fine dining at Revel, the beachfront resort opening in Atlantic City. As a complete entertainment destination, Revel will encompass more than a dozen other restaurants, two nightclubs, a private beach club, more than 1,800 guest rooms, retail shops, a 31,000-square-foot spa, two theaters that seat 5,500 and 700 guests respectively and a 150,000-square-foot casino. Opening in May, Revel will bring a true resort option to the Northeast, enhanced by entertainment and lifestyle offerings designed by top performers in daylife, nightlife, theatrical, spa, and experiential programming. Features of Allegretti’s menu will include handmade pastas, Mediterranean whole fish, a raw bar, and composed dishes from the land and sea, accompanied by a renowned wine list. Each culinary partner at Revel has a vested interest in the resort and brings signature flair from their regional restaurants in Philadelphia, New York and Washington, D.C. The ocean view restaurant space of Azure by Allegretti will be accented by Christian Lacroix curtains and vibrant azure blue tiled floors, evocative of its coastal inspiration.